Sinoatrial arrest occurs when the sinoatrial node does not discharge an impulse for ≥2 seconds. Failure to discharge an impulse within <2 seconds is defined as sinoatrial pause. Refer to Figure 1. Figure 1. Sinoatrial arrest. Also note the ST-segment elevations (which in this case has no relation to the sinoatrial arrest). As discussed in Chapter 1, if the sinoatrial node fails to discharge an impulse, there are three latent pacemaker structures that can (and will) discharge impulses that will salvage the situation. Latent pacemakers can continue discharging impulses until the sinoatrial node recovers and starts discharging. Less than 3 consecutive beats (or from a latent pacemaker (or any other ectopic focus) are referred to as escape beats. Three or more consecutive beats from a latent pacemaker (or other ectopic focus) is referred to as an escape rhythm. Specific clusters of atrial myocardium: There are clusters of atrial myocardium that possess automaticity and thus pacemaker function. The intrinsic rate of depolarization in these cells is 60 beats per minute. The resulting P-wave is morphologically different from the sinus P-wave, but the QRS complex is normal (provided that intraventricular conduction is normal). This rhythm may be referred to as atrial rhythm. Cells near the atrioventricular node: The atrioventricular node does not possess automaticity, ut cells surrounding it do. These cells are capable of generating an escape rhythm with a rate of 40 beats per minute. QRS complexes are normal (provided that intraventricular conduction is normal). 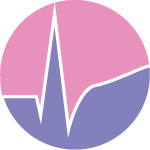 If the P-wave is visible, it is retrograde in lead II (because of the reversed direction of atrial activation) and may be located before or after the QRS complex. This rhythm is referred to as junctional rhythm. The His-Purkinje network: All these fibers possess automaticity with an intrinsic rate of depolarization around 20–40 beats/min. If the impulses are discharge from fibers proximal to the bifurcation of the bundle of His, QRS complexes will be normal (QRS duration <0.12 s), because both bundle branches receive the impulse and spread it. If the impulse is discharged distal to the bifurcation of the bundle of His, the QRS complexes will be wide (QRS duration ≥0.12 s). 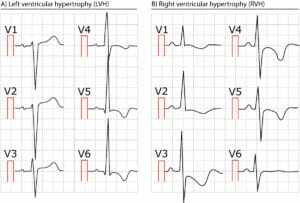 The escape rhythm with wide QRS complexes are referred to as ventricular rhythm. All these rhythms are regular. Since there is competition between these latent pacemakers, the one with the fastest intrinsic rate of depolarization will be the pacemaker, which means that it usually is atrial myocardium. Asystole occurs if no escape rhythm awakes. It is uncommon that sinus arrest leads to persistent asystole; latent pacemakers virtually always awake and salvage the rhythm. Syncope due to sinus arrest is refferred to as Adam-Stokes attack. Side effects of drugs (diltiazem, verapamil, beta-blockers, digitalis). Sinus arrest/pause due to increased vagal tone does not necessitate treatment but it might be wise to observe the patient for 24 hours (including ECG monitoring). 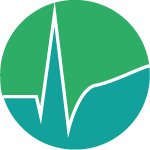 In all other situations the underlying condition should be targeted and, if necessary, bradycardia should be treated (treatment alternatives are discussed in the article on sinus node dysfunction).